Dr. Michael Schwartz explains four of the most common reasons patients undergo a second breast augmentation. 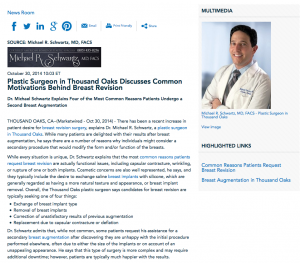 Thousand Oaks, CA—There has been a recent increase in patient desire for breast revision surgery, explains Dr. Michael R. Schwartz, a plastic surgeon in Thousand Oaks. While many patients are delighted with their results after breast augmentation, he says there are a number of reasons why individuals might consider a secondary procedure that would modify the form and/or function of the breasts. Dr. Schwartz admits that, while not common, some patients request his assistance for a secondary breast augmentation after discovering they are unhappy with the initial procedure performed elsewhere, often due to either the size of the implants or on account of an unappealing appearance. He says that this type of surgery is more complex and may require additional downtime; however, patients are typically much happier with the results. Ultimately, Dr. Schwartz says he recognizes there are a variety of reasons why patients may desire breast revision, and he endeavors to understand the unique motivations, aspirations, and anatomic needs of each individual while providing natural-looking results women will love. Certified by both the American Board of Plastic Surgery and the American Board of Surgery, Dr. Schwartz is a plastic surgeon based in the Thousand Oaks area. He completed his general surgery residency at the University of Southern California, and plastic and reconstructive surgery training at The University of Texas Southwestern Medical Center in Dallas. He is an active member of several prestigious medical organizations, including the American Society of Plastic Surgeons, the American Society of Plastic Surgery, and The American Society for Aesthetic Plastic Surgery. He is the recipient of numerous awards and has been in private practice since 1998. Dr. Schwartz is available for interview upon request.